Murphy’s Law of Combat states, no initial plan survives initial contact intact. This is a true statement. The night before my intent was to hit the Guadalupe River early and hunt some late season Rainbow Trout. 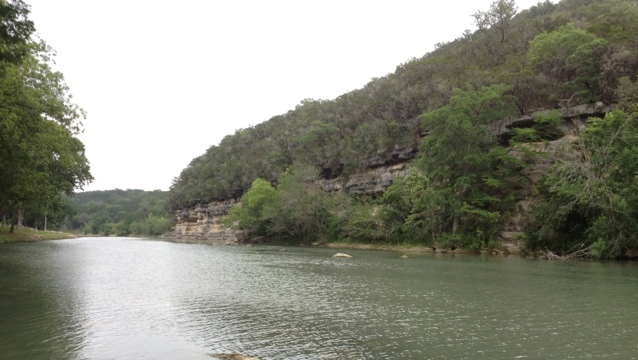 Texas spring in the Hill Country feels a lot like summer for most and anything after sun up is pushing it for trout. Unfortunately intent is not defined as action. Having completely overslept the morning in I was finally boots on ground at the Guad about 3 hours late. Fail. I say again, massive fail, over. The view was nice but the water was ugly and cold. I couldn’t keep the algea bottom growth of my fies to save my life. It was floating everywhere. After about four hours of misfires and no fish to show- it was time to shift fire. Like a wise little grunt I’ve bookmarked every place my Battle-Buddy Dave (aka Fish Drill Instructor) has taken me. I’ve got the intel plugged in and save on my iPhone. I needed to make a quick move and fast before the BOB (big orange ball) dipped over the horizon and I was running blackout (no light) ops. So off to the Blanco I went. Transitioning over was easy. A quick leader and tippet swap/re-rig drill and I was ready. 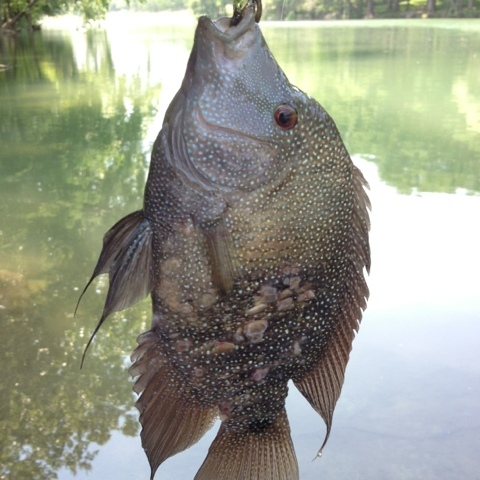 Right off the bat I had a hunk of a Rio in hand- sort of… I held the line not the fish. 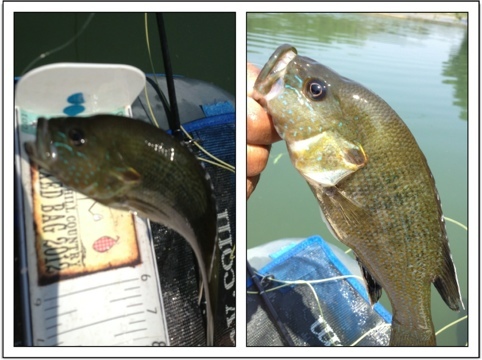 This guy was 9″ and took new new arsenal of self tied Flying Cats (as did all the others) I reloaded on the other day. He also had some funky blistering going on. It was nasty- Medic!!!!! 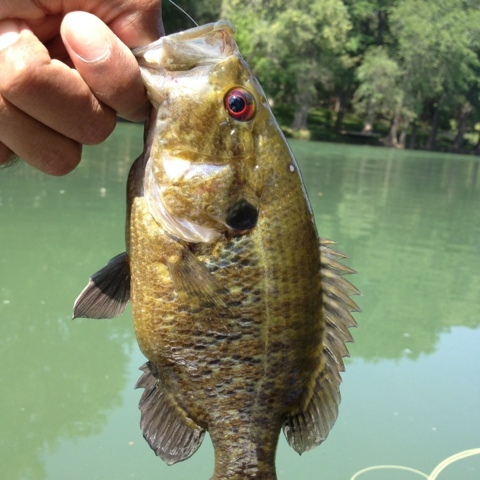 Following in trail was a green sunfish. It bears to note this guy did not want his picture taken and fought it well. I won. Next to hand was my war face painted warmouth brother. Pretty fish. I have not seen a lot of these fellas before but I have been running into them a lot lately. This was the first one to hand to meet the contest minimum and came in at 8.5″. 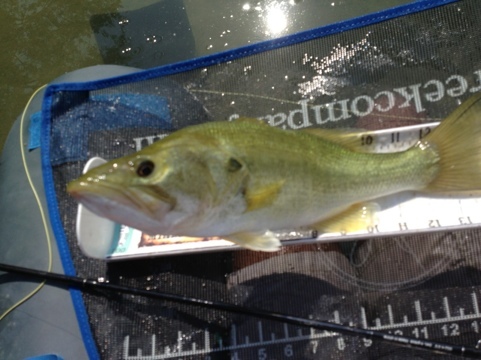 Bringing up the rear was a 15.5″ largemouth bass. He wouldn’t sit still either but it always makes my day when I get a decent bass. This was a nice final touch to add points to the board. All in all it was the best thing to get skunked on the Guad that day. Sometimes you have to just know when to shift fire. I dunno, now that you are using an unlimited supply of Flying Cats doesn’t it feel like cheating? I don’t know- do you call fire superiority cheating? Do you call winning cheating? Besides you know how easy I lose flies. Glad to see you turned adversity into a great day on the water. Good job on the scoring too, i think i’ll have to invest in some Flying Cats (Soaring Kittens?) just to stand a chance in this contest. Perhaps that was David’s plan all along?! Well if I had to pin Dave for Binky or the Brain- I definitely think Brain. It’s a good fly and even better that you can buy them or learn how I tie them on Texasriverbum.com. The how to video is good- again so easy a grunt can do it. I’ll be chasing bows soon because you had the right idea to get one early. Thank you much.